The perfect cross-border banking bundle for Canadians who live, work, visit or study in the U.S.
$59.50 per year with paper statements. 0% introductory APR for 6 months. After the introductory period, a variable interest rate of between 12.24% and 22.24% will apply. This APR will vary with the market based on the prime rate9. Note: To sign up for a Visa Signature Black credit card, you must open or already have an RBC Bank U.S. bank account. Offer is available for Snowbirdadvisor.ca members only who also become new clients of RBC Bank (U.S.). A new client is defined as an individual who has not been a primary or secondary accountholder on any RBC Bank U.S. checking account for the 12 months prior to the start of the offer period. To qualify, client must open a new RBC Bank Direct Checking account and apply for an RBC Bank credit card at the same time as the checking account. Promotion code – SNOWBIRD – must also be submitted with the application to qualify. Employees of Royal Bank of Canada do not qualify for this offer. Direct Checking account must be funded according to the Personal Schedule of Fees. For eligible clients, RBC Bank will waive the Direct Checking annual fee for 1 year. All other checking account fees apply. After 1 year, the standard annual fee will begin to be charged. If a client applies for a RBC Bank Visa Signature Black Plus credit card, the annual fee of the credit card is not waived. Offer is available for a limited time only and can be withdrawn at any time. No foreign transaction fees or transfer fees will be charged. Foreign exchange rates apply when converting currencies. Standard account charges may apply. Maximum transaction limits may apply and are subject to change. Availability of the money will depend on the time when it is sent from Royal Bank of Canada or RBC Bank. Transaction may not appear on your account transaction history until the following day but will reflect the date of transfer. Many Canadian credit cards charge a foreign transaction fee of 2.5%, which equals $25 for a $1,000 USD purchase. Based on an average spend of $10,000 per year in the U.S. on a Canadian credit or debit card with a foreign transaction fee of 2.5%, plus two (2) wire transfers per year at a cost of $30/transfer. Do I need a U.S. address to open a cross-border banking bundle? No. You can use your U.S. or Canadian address to open a cross-border checking account and credit card with RBC Bank. How do I move money from my Canadian RBC Royal Bank account to my new cross-border RBC Bank U.S. bank account? It’s easy to move money once in Online Banking. With just a few simple clicks the currency conversion is done and the online transfer is complete. The money moves instantly and the transfer is free2! How can I get U.S. cash while in the U.S.? Use your debit card at one of our 50,000+ no-fee U.S. ATMs3 to access funds from your account. RBC Bank never charges a fee when you any U.S. ATM. Plus we’ll refund the fee that other banks charge3 – up to 2 fees per month for Direct Checking, upon request. You can also get cash back while shopping at many large retailers, such as grocery stores. Simply use your U.S. debit card and select “cash back”. 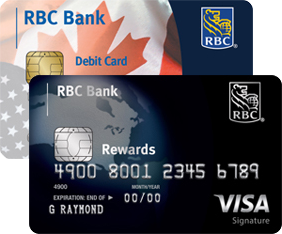 I don’t have a U.S. credit history, can I qualify for an RBC Bank U.S. credit card or mortgage? Yes! 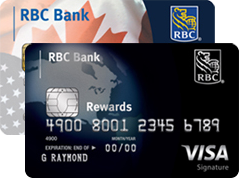 RBC Bank will use your Canadian credit history and relationship with Royal Bank of Canada when you apply for a credit card or mortgage. How do I earn RBC Rewards points? It’s easy. Just use your RBC Bank U.S. credit card for purchases in-store or online and you’ll earn rewards. Travelling to the U.S. this March Break? Don't take a break from travel insurance! Get affordable travel insurance and the free PATH app10! Two ways to travel smarter with RBC Royal Bank.